From the cook book, it says Easiest-ever Biscuits and Berries. 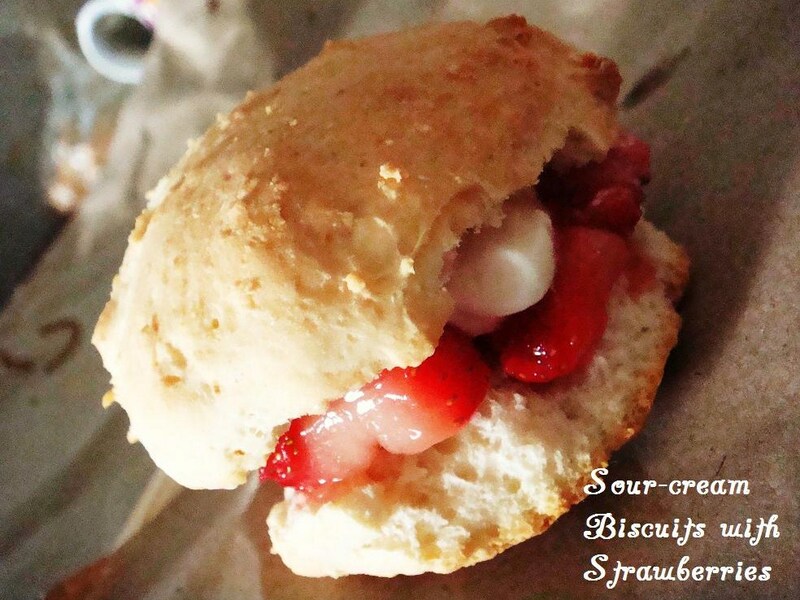 i’ve decided to rename it a little and called it Sour-cream Biscuits with Strawberries. the only ingredients required in this recipe is just equal parts of sour cream (or you can use crème fraîche) and self-raising flour, strawberries and some sugar. no beating/whipping required, hence making this recipe, really, the easiest and quickest of all that i’ve made. the reason why i made this is due to the leftover strawberries that i have after making the pavlova, hence i was ransacking through the recipes that i have gotten over the years to find an easy-to-make dessert and this is what i’ve found. it didn’t really ended up like a biscuit actually as it was crisp on the outside, but soft on the inside. somewhat of a cross between a biscuit and a bread. i was wondering if it’s because of my kneading of the dough as my kneading skills are still… pretty bad i believe. oh well, it didn’t really matter in the end as this ended up as a pretty light dessert for me. the biscuit has no sweetness at all in it, and you can’t taste any hint of the sour cream in it as well. it’s just bland, but flavoured by the strawberries and the additional sour cream. personally i quite like it because it’s a unique twist, different from the usual sweet desserts that i usually have. secondly, it has strawberries in it (my ultimate favourite). and lastly, it’s super easy. Preheat oven to 210 degrees Celsius. Line a baking sheet with baking parchment. In a bowl, add in flour. Stir in sour cream with a fork until they come together to form a dough. On a well-floured table, turn out dough and knead several times (remember to flour your hands as well!). Place onto the baking sheet and bake for 15min, until golden-brown in colour.